Eating for Energy Review (2019) - More Energy With Little Effort? Eating for Energy Review – More Energy With Little Effort? Most of us are overweight, out of shape, and tired all the time. It’s hard getting fit and eating right, and doing both is a lot of work. Yuri Elkaim, the author of Eating for Energy, says that his nutrition plan can help you lose weight, get fit, and have more energy than ever before. Not only that, but he says you can do it without spending hours in the kitchen or buying a lot of expensive “diet” foods. That sounds pretty promising, so I thought I’d take a closer look and see what Eating for Energy is all about. Is the book on the up and up? Is it everything it says it is? Or is Eating for Energy a scam? Read on for the full Eating for Energy review. Eating for Energy is sold as a downloadable ebook in PDF format, which means that you can download it immediately after purchase. PDF books can be read on any computer device, PC or Mac, or even a smartphone. The book was formerly available as a print book, but the Website indicates that the print version is sold out. Eating for Energy is a 272 page book that covers the author’s opinions of what’s important in nutrition, what he’s done about it in his personal life, how adopting his system can help you, and, of course, the recipes and meal plans that allow you to put it all together. 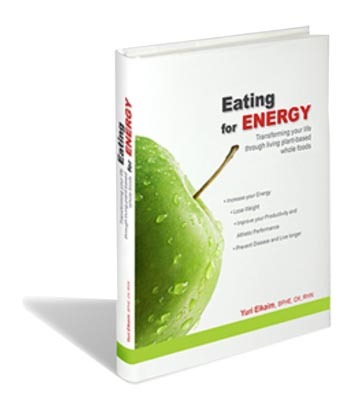 Eating for Energy is well laid out and nicely formatted, though it’s written in a two-column format that would work better in a print book than it does in PDF format. Still, it’s an attractive book and makes for an interesting read. Yuri says that our bodies and our diets are too acidic, and that we should work towards trying to get our bodies more alkaline. This can be done by changing what we eat from meat and dairy foods that are mostly acidic, to vegetable-based foods that tend to be more alkaline. We also need more enzymes in our diet, and a lot less of the usual sorts of things that most weight loss books suggest we stop eating. That would involve meat, dairy, wheat, sugar, processed foods and coffee. Eating for Energy says that we should drink lots of water, and we all know that we should be drinking more water, right? In addition, there’s a section on exercise. Sorry to disappoint, but you can’t get fit and lose weight without some sort of exercise. Eating for Energy recommends that you spend 30 minutes a day walking, and that you should get some proper aerobic exercise two to four times per week. Yuri also recommends that you reduce stress and get proper rest, and he has a number of tips for helping you reduce the stress in your life. The bulk of the book is, as you might suspect, devoted to diet. The Eating for Energy diet is going to consist of lots of green vegetables, a fair amount of fruit, some good, healthy fats, and a few “leisure foods.” That means that you won’t have to cut out the foods you enjoy completely, but you will need to minimize them. The bulk of what you’ll be eating from now on is plant based. That doesn’t mean “tasteless” or that it’s going to be hard to prepare or difficult to eat. Not at all. In fact, the recipes in Eating for Energy look to be delicious. 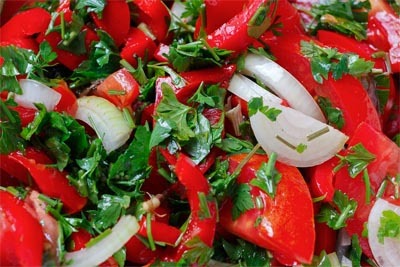 There are smoothies, and salads, sandwiches and wraps, soups and lots of pasta dishes, though the “pasta” in these recipes is usually julienned or spiral-sliced vegetables, rather than traditional, grain-based pasta. With a nice sauce on top, you’ll likely enjoy these pasta dishes just as much as if they were made with traditional pasta, and it’s actually very little work to prepare these tasty treats. Eating for Energy includes a good section on how to prepare your kitchen for your change in lifestyle, as well as a lot of information about how to mentally prepare for the change in your diet, and the change in how you’re going to feel after you’ve been on the Eating for Energy system for a while. I’ve found Eating for Energy to be one of the best books I’ve read in the weight loss and nutrition sector, and it’s obvious that Yuri really lives for this. This is not a case of a book that he wrote to “cash in,” but rather a book that he wrote because he lives this diet himself, has benefited from it, and wants to share it with you. The book is well-written and easy to follow. The recipes are tasty and easy to prepare. The meal plans appear to be nutritionally sound, and with the recommended exercise, you’ll likely improve your overall health and fitness quite a bit if you follow this system. If you’re interested in feeling better, losing weight, getting fit, and having more energy, you’d likely do well to give the system outlined in Eating for Energy a try. The book is thorough, well-written, and covers a lot of information about nutrition and how our bodies process the foods that we eat. The recipes are tasty and easy to prepare, and varied enough that you aren’t likely to get bored with them during the 12 weeks of the meal program. There aren’t any weird or odd foods there, so you should be able to find everything you need at your local grocery store. Eating for Energy is highly recommended. Click here to visit the Eating for Energy Website. 80/20 Fat Loss Review - Big Results From Small Changes? Eczema Free Forever Review - Cured in 3 Days? Fat Burning Brain Review - Think Your Way to Losing Weight? Simple Superfoods Review - Weight Loss Made Simple?